Fountainhead secured rezoning for the property in November 2016 to accommodate the project, striking a deal with city leaders to replace an access-road bridge over Manchester Canal and pay for reconstruction of connector roads on the site. Called South Falls I, the first tower would include 256 apartments with river views in the 14-story, L-shaped building, according to plans filed with the city. It also will include 2,400 square feet of ground-level retail fronting the canal at the entryway of the development. No plans for the second tower, South Falls II, have been filed. Papa estimates that building could total 225 apartments. “If there is a lot of preleasing before the first building is done, then we would look into starting construction on the second building,” Papa said. The project’s first phase would include 279 parking spaces in a parking garage and surface lot between the two towers. Work on replacing the access bridge over the canal is set to commence this summer, Papa said. 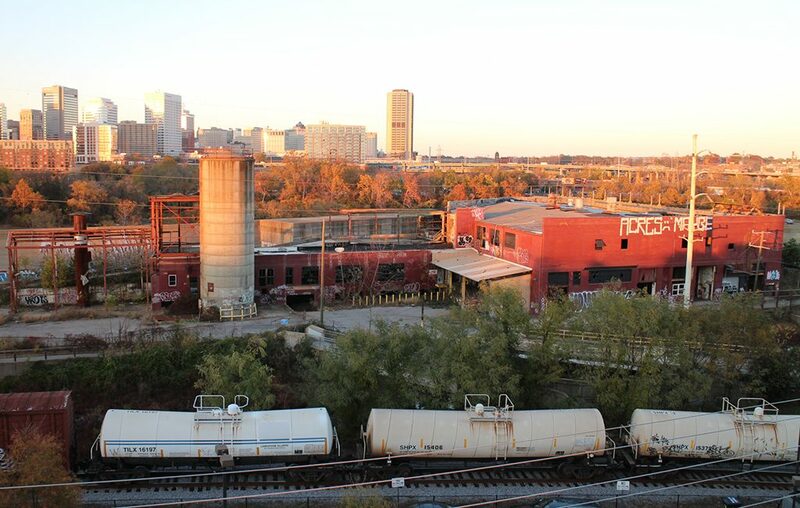 Once the new bridge is in place, demolition would begin on derelict, graffiti-tagged buildings on the site, and work on the tower could begin by late fall. The project would take 15 to 18 months to complete. Richmond-based KBS Inc. is the general contractor for South Falls I. Walter Parks Architects is designing the building. While the majority of the building’s apartments will be rented at market rates, Papa said 20 percent of the units will be set aside for renters who make less than 80 percent of the area median income. The average market rate for a one-bedroom apartment in Manchester ranges from $995 to $1,100, while a two-bedroom unit ranges from $1,150 to $1,300, according to Apartments.com. South Falls I adds to a growing list of developments that Fountainhead and WVS have underway across the city. Across Hull Street near the Southern States silos on Manchester Road, the team has nearly 4 acres under contract for another mixed-use development that could bring 200 more apartments to the area. The two firms are also behind a $58 million, 12-story apartment building under construction at 1001 E. Byrd St., on a 1.2-acre site between WVS’s Locks development and Riverfront Plaza. They also are working together on a 105-unit apartment building at West Grace Street and Stuart Circle that will replace a parking lot behind St. John’s United Church of Christ. Meanwhile, Gregory’s Lynx Ventures is readying a 2-acre surface lot at 400 Hull St. for a $50 million to $60 million mixed-use development dubbed The Current. Two five-story buildings will rise on the site: one with 40,000 square feet of office space above 6,000 square feet of ground-level retail mostly fronting Hull Street, and the other near Fourth and Hull streets that will house 214 apartments above 10,000 square feet of ground-level commercial space. Construction on The Current is slated for the fall. Papa, who has worked for years to secure the parcel for South Falls, said the initial stage of the project will help create a gateway for Manchester.